Rouge takes first place in the Best Tried and True category in the 13th Annual Best Restaurants Awards. Rouge uses local ingredients and consistently serves sophisticated and creative dishes. Executive chef Jamie Harling, serving duck confit perogies, braised red cabbage, crme frache, dill, Northern Divine caviar, beet dashi. They say it’s more difficult to stay on top than to get there. For Rouge to get on the top of this list, as it did last year in Avenue, we might point to the charismatic restaurateur duo of Paul Rogalski and Olivier Reynaud, who saw potential in a heritage building that was underutilized back in the early 2000s and took a chance that Calgarians were finally ready for some seriously fine dining. Or that it was named to the prestigious S.Pellegrino world’s 100 best restaurants list in 2010 and hasn’t faltered since. And that it consistently offers one of the most sophisticated, innovative and technically strong chef tasting menus in the city, with a level of classically professional service befitting the care and attention paid to the plates. For Rouge to stay on top for the second year in a row – well, that has much to do with the exceptional talent of executive chef Jamie Harling. 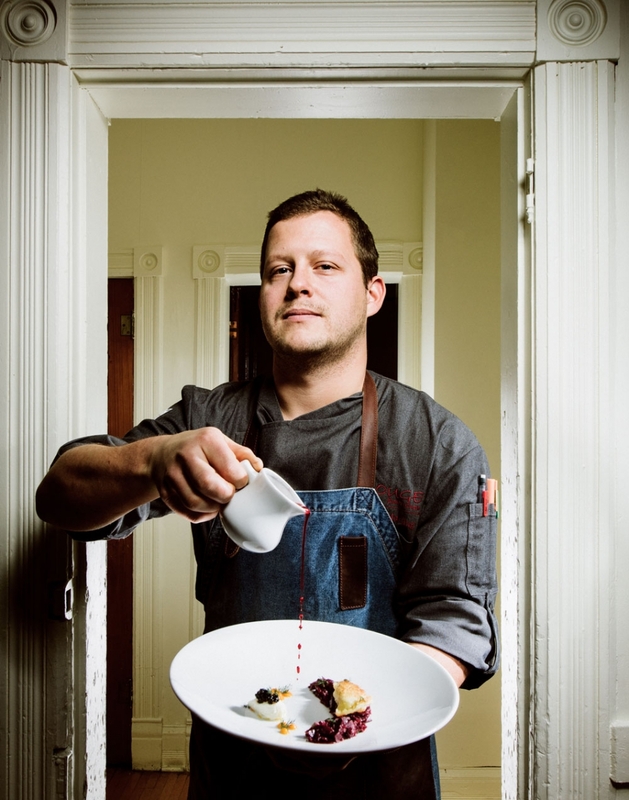 An approachable and humble chef whose true love lies with local ingredients, he works closely with Rogalski to develop menus and dishes and then executes them with precision and clarity. Behind his refined food, there is nothing but pure honesty and dedication to these ingredients, many of which he grows in the Rouge garden.